Latest Update "August, 4 2014"
around 50,000 volts on a slower pulse rate. The main power limitation to these two devices is T1. 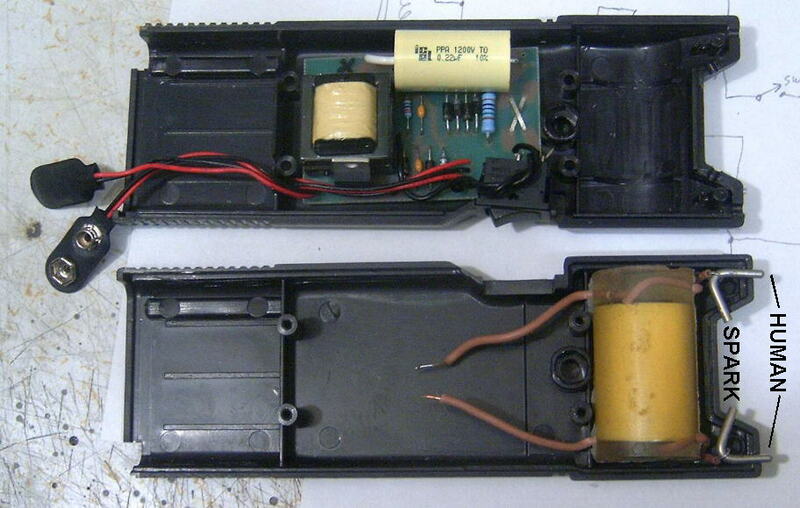 These are actually minature "Audio Transformers"
connected in reverse to step up the 12 volts to around 400 volts, with no load. that would result in a more sustained spark on the output. more efficient circuit. For Simplicity and "Off the Shelf", this was the best I could do. If your an adventurist, you could wind a small transformer for any of these units below. This would allow for higher efficiency and more current draw. On the "Low Power" Stun-gun, Current draw is about 80 Ma at 9 volts. 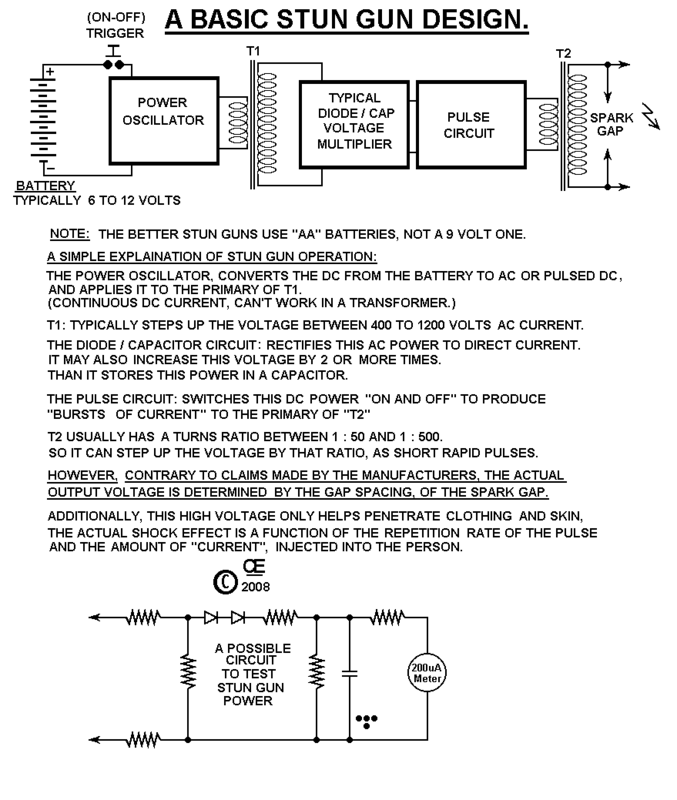 On the "More Power" Stun-gun, Current draw is about 225 Ma at 9 volts. Most Commerical Stun Guns, use either a "Spark Gap" or a "Surge Arrester" (Movistor) to control Triggering of T2. 1) These Spark Gaps are just a Cross of two Metal strips. Adjusting them is somewhat Critical and they are NOT very reliable over time. Like Relay Contacts, they get Pit marks and than Fail to work properly. 2) Surge Arresters are made for Fixed Voltages. Athough they are a simple solution, they don't allow for easy tuning of the output spark rate. Mostly they use Movistors rated between 800 to 1400 Volts. As an alternative to these, I use an "SCR", as these allow for a good & reliable adjustment to trigger T2. 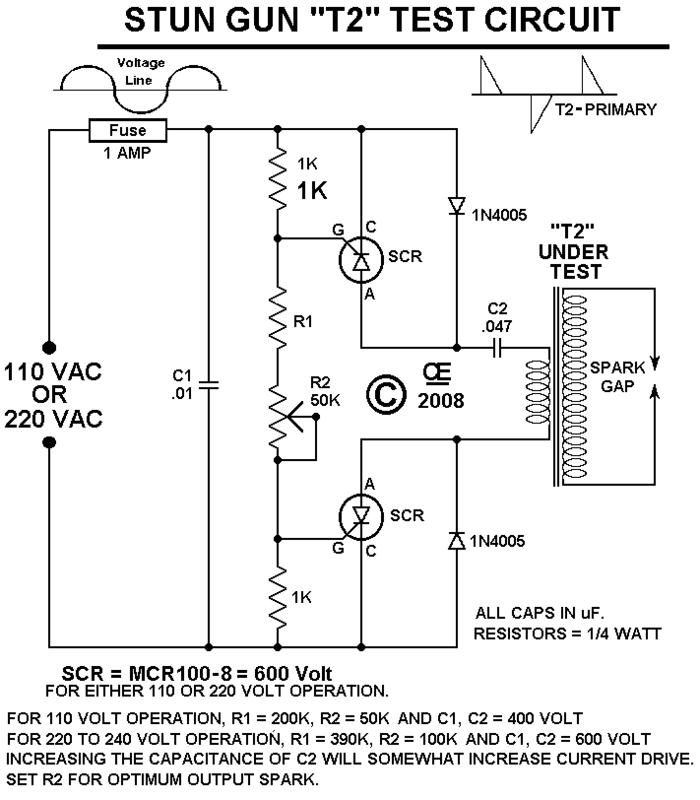 The biggest draw-back is finding really high voltage SCR's. The SCR I normally use is rated at 800 Volts @ 0.8 Amps. Thats Not too bad, but a 1000 to 1200 volt rating would be nicer. My hope is this info is a Help to some of you who just like to play a bit and get a understanding of them. In No Way Do I Recommend Building these Stun-Guns or the actual use of them for any purpose what so-ever. I Assume NO LIALIBITY for any resulting actions of those persons who build or use any of these devices! 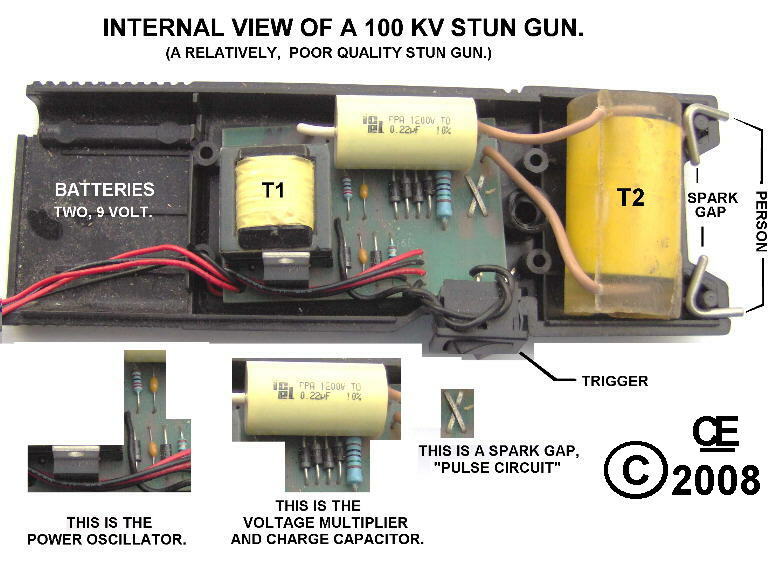 A Real Misconception about Stun-Guns, Is the Output Voltages. and any spark capable of pentrating through the clothing and skin is totally sufficant to do the job. "MUCH HIGHER CURRENT" and GETS REALLY DEADLY. 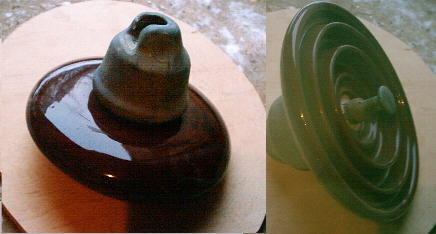 A Point to Ponder, Here is a picture of a 10 inch Diameter Porcelain Insulator! This is the type used on the High Tension Power lines that run through the country side. On a 750,000 volt line, they will use about 35 of these insulators hooked together in a series string. The "Flash-over Voltage" of this Insulator is 80,000 Volts and that is over a "surface distance" of about 11 inches. 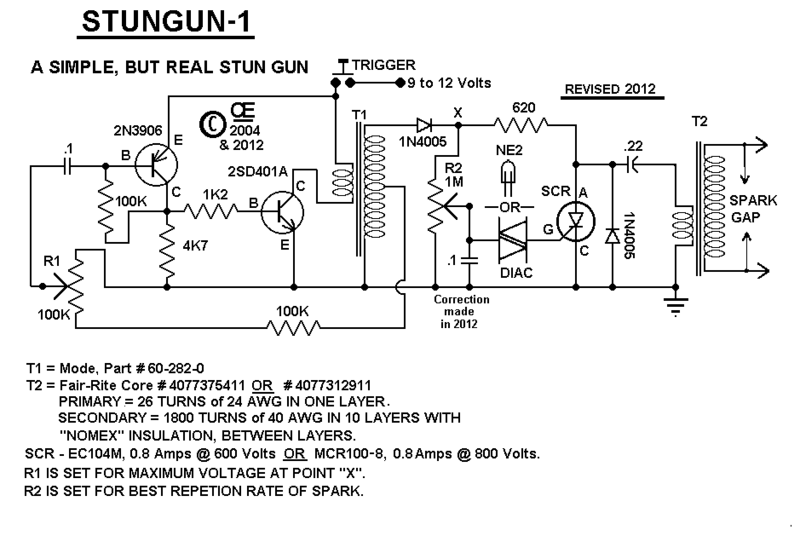 When have you ever seen a 100 KV Stun Gun with even a 10 inch Spark Gap? In Reality, the spark gap determines the "Actual Voltage Available at the probes". With a spark gap of 1 to 2 inches or so, it is No-where near the 100,000 to 750,000 volts that these manufacturers claim. 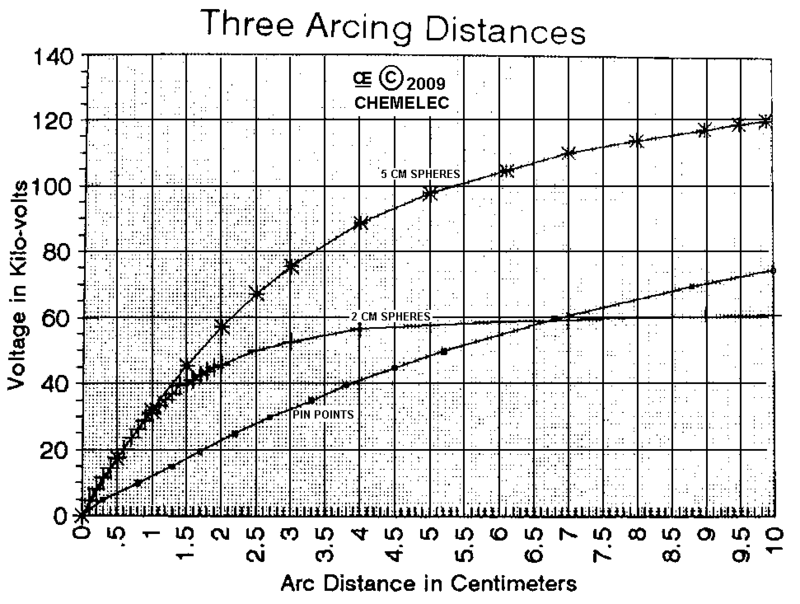 GRAPH for Arc-Voltages/Distances, for Various probe shapes. It is Highly Unlikely any of these can Exceed 80 KV. I can supply the Small Transformer for Either one of these Circuit. I can Also Supply the Fair-Rite Core, Part #4077375411. Or a Smaller one, Part #4077312911, that works Equally Well. Additionally, I can also supply some of the other parts and wire. 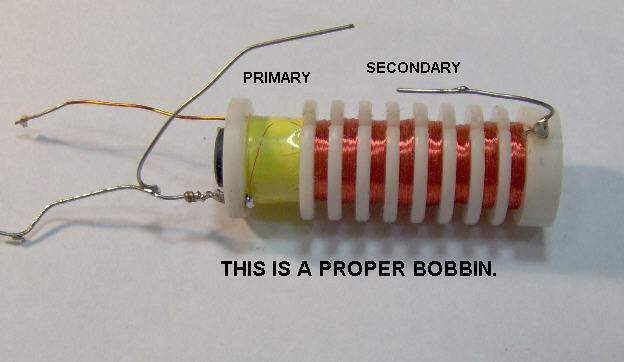 However, In No WAY will I supply a Bobbin for T2, or make this transformer for Anyone. It MUST be "Vacuum Potted" in Epoxy Resin or Another GOOD Insulating Materials. Most Wax's are Not very good, as they have a high Moisture content. 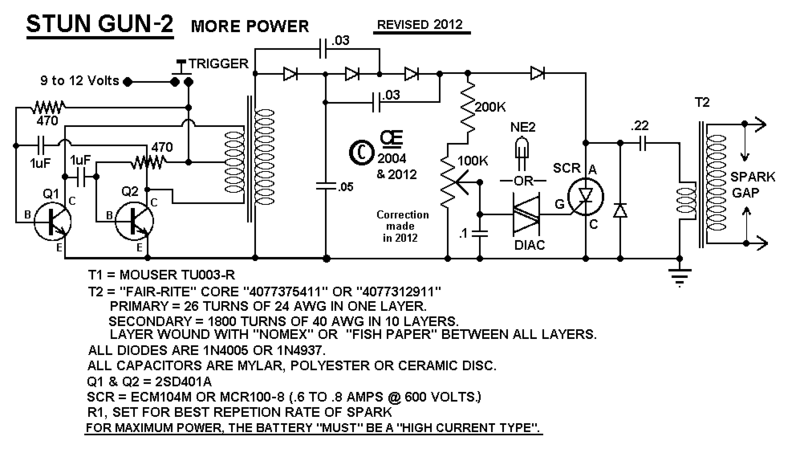 Go Back to "My HOME Page"
This is a "REVISED SCHEMATIC" with a Better Transformer for T1. 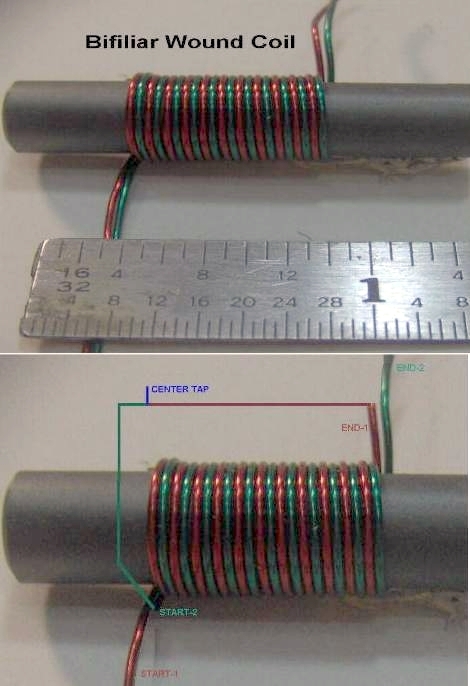 HOW to Wind a "Bifiliar Coil"
A Simple Tester to determine possible Faults in T2 Transformers. This was just a Quick "mock-up", to show how its done. T2, wound on a fairly good Bobbin. A Commerical Made Stun Gun. Here is an Inside View. is a Cheap way to replace the small SCR Timing Circuit that I use in my Designs. Its a Small Spark Gap, but is not easy to adjust properly and definately Not very reliable. The Output Spark gap shown here is 15/16" and the Human Contact Probes are spaced 2 inches apart. This unit is Faulty, (Bad Transformers) But I would estimate the output was about 50KV.